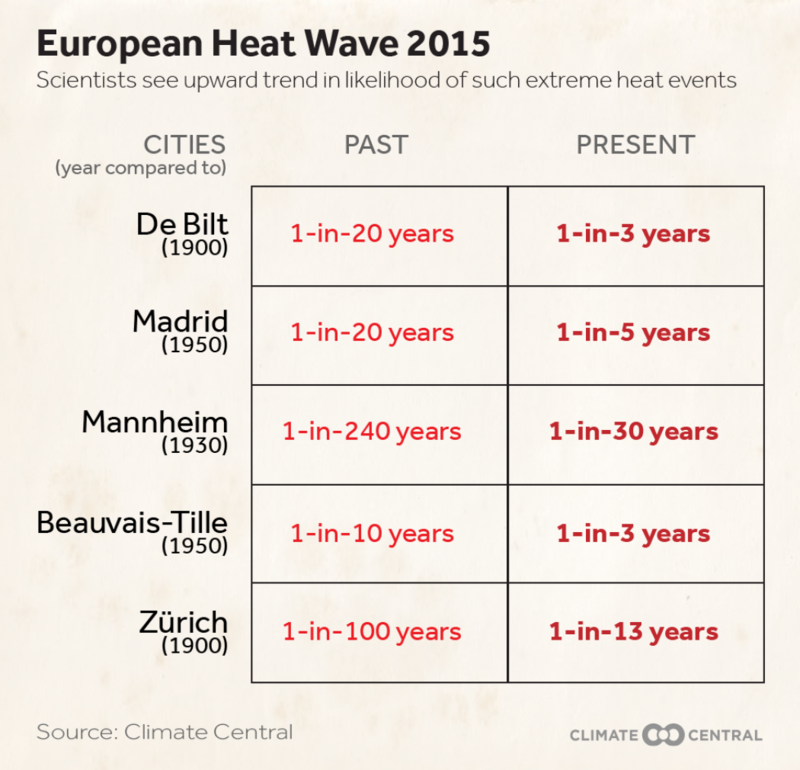 As we reported last week, for this ongoing heat wave in Europe, Climate Central convened an international team of scientists from Oxford University, KNMI, Red Cross Red Crescent Climate Centre, along with regional partners from CNRS (France), DWD (Germany), and MeteoSwiss. They produced a preliminary analysis of the annual maximum of 3-day maximum temperature based on observations up to July 1 and forecasts up to July 5. Now, that analysis has been redone using observations up to July 6, by which time the heat wave had subsided over most of Europe. The scientists used two independent methods in this analysis, allowing for high confidence in the results. In one method, a statistical analysis of observational records was performed (using the KNMI Climate Explorer) to compare this summer’s heat with summers during the early part of the century, before global warming played a significant role in our climate. This detects trends but cannot attribute the causes. The second method, conducted by our researchers in Oxford, uses a large computing network (weather@home) to simulate the likelihood of seeing days as hot as those Europe has been experiencing over the past week. At the same time, we also simulated a summer without human-influenced climate change. Comparing those two “worlds,” we found that in the 5 cities analysed, the current conditions are now at least twice as likely due to climate change. The model does not include the urban effects that are accounted for in the methodology based on observations of urban stations. “The regional weather@home model serves as a nice way to do an independent check on the observational analysis,” said Oxford’s team lead Friederike Otto. “Think of the combined results as a good first step towards answering the climate question.” In this case the Oxford team was a bit limited because the observed sea surface temperatures that drive the model are not yet available. Instead, the summer of 2014 was used as a proxy. The team felt the choice was solid because the influence of the exact sea surface temperatures on summer temperatures in Europe is small compared to the overall effect of global warming. In De Bilt, the trend analysis of the observational data shows that a 3-day period as hot as experienced over this past week is now more than 4 times more likely to occur than it was around 1900. Using the weather@home model, scientists estimate that climate change has made the observed heat wave almost two times more likely to occur. This means that what would be a 1-in-7 year event in the world without climate change is now a 1-in-4 year event. In Madrid, using the weather@home model, we estimate that climate change has made the observed heat wave 5 times more likely to occur. Said differently, what was once a 1-in-100 year event in the world without climate change, is now a 1- in 20-year event. In Mannheim, the trend analysis of the observational data shows that the heat wave was a rare event even in the current climate. A 3-day period as hot as experienced over the past week should occur roughly every 30 years now, but, using the weather@home model, we estimate that climate change has made it almost 4 times more likely to occur. In Beauvais-Tille (a town 80 km north of Paris, far beyond the suburbs with a good series of observations without urban effects), the trend analysis of the observational data shows that an event like the 2015 heat wave is now expected every three years. Using the weather@home model, we estimate that climate change has made the observed heat wave 25% more likely to occur. In Zürich, the trend analysis of the observational data shows that a 3-day period as hot as experienced over the past week is expected nowadays every 15 years or so. This is more than 2.5 times more likely than it was around 1900. Using the weather@home model, we estimate that climate change has made the observed heat wave about 3 times more likely to occur. What would have been a 1-in-40 year event in a world without climate change is now a 1- in- 15 -year event.